In the first part of the 30s in the 20th century, the new chapter of the German history has opened – of the Germany that was facing more than only an economical crysis. On 30th January 1933, the office of chancellor of the, at that time still, republic, was taken by the leader of the National Socialist German Worker’s Party (NSDAP) – Adolf Hitler. In a short time the supporters of the superpower politics, braking with the resolutions imposed on the Berlin on the strength of the Treaty of Versailles, signed in 1919, seized both power and control of the country. The birth of the Third Reich was proclaimed, with Hitler acting as the Leader (Führer), at the head of the state. Any restriction, supervised by the international community, was rejected and turned down, what clearly and unambiguosly led Germany on the path towards a new war. 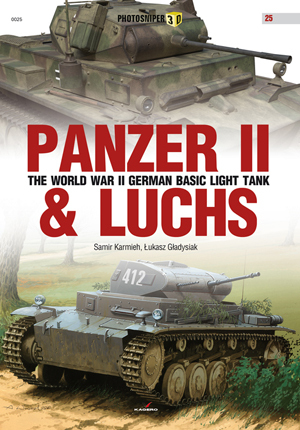 In those fervent and ardent times, even before announcing the restoration of the compulsory military service and setting up Wehrmacht in place of the Republican Armed Forces, a new armoured divisions development programme was launched in Berlin. Soon, the assembly lines began producing light tanks Pz.Kpfw. I Ausf. A and the prolonged, developmental version – Ausf. B, which in larger and larger amounts joined the ranks of new Panzerwaffe sub-units, formed over and over again. Shortly afterwards it turned out, among others during field manoeuvres in various parts of the Third Reich, that in case of escalation of armed conflict with two basic enemies: Poland on the east and France on the west, these vehicles might turn out to be inefficient in combat. One of the main weaknesses and foibles of the Pz.Kpfw. I was the armament consisiting of only two 7,92 mm machine guns Maschinengewehr 13, which performed well against enemy infantry, but made quite a poor opponent for the enemy tanks. In July 1934 the VI Department of the Army Weapons Agency (Heereswaffenamt) issued an order to create plans of a vehicle weighting approximately 10 000 kg – in the shortest period possible. This vehicle was meant to support the front line armoured troops. This project, just like all the previous military projects, was concealed and code-named “Farming tractor 100” (Landwirtschaftlicher Schlepper 100 or LaS 100), marking it also as Versuchs Kraftfahrzeug 622 [German: Experimental vehicle 622]. The addressees of this directive were 4 companies: Friedrich Krupp AG with seat in Essen, Henschel und Söhn in Kassel, Nuremberg Maschinenfabrik Augsburg-Nürnberg (MAN) and Daimler Benz AG at Berlin-Marienfeld. In October 1935 the first of the abovementioned factories presented a prototype marked as LKA II. It was the developmental version of Pz.Kpfw. I Ausf. A with larger, manually turned turret, armed 7,92 mm MG 13 machine gun and with quick-firing cannon Kampfwagenkanone (KwK) 30 L/55, cal. 20 mm, which was a commonly used anti-aircraft cannon Flugabwehrkanone 30, cal. 20 mm, converted for use in armoured fighting vehicles. Soon the other companies – MAN and Henschel – presented their proposals, and this solution, consisting of three bogies, two road wheels [sometimes called also “suspension wheels”] each, was approved for production. The turret was taken from the Krupp company’s project. 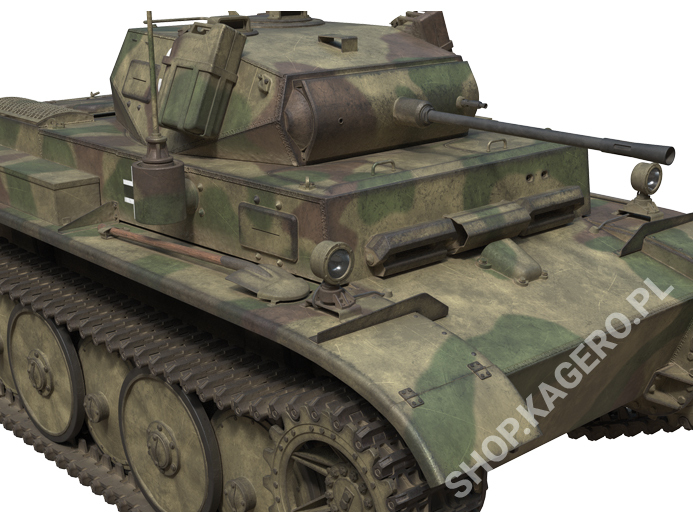 The new, German light tank was labeleed as 2 cm Maschinengewehr Panzerwagen and after a new armywide terminology was established – its name changed to Panzerkampfwagen II Ausf.a Sonderkraftfahrzeug (Sd.Kfz.) 121. The powerplant of this vehicle, which total mass amounted to 7600 kg, was a six-cyllinder, 130 HP Maybach HL57TR petrol engine, of almost 5700 ccm displacement, capable to accelerate the vehicle to maximum road speed of 40 km/h (29 mph). The fuel – classic, German military 74-octane petrol was stored in two tanks – first one containig 102 liters and the second one – 68 liters. It granted the range 210 km on road or 160 km in cross country – in one tank. The three-person crew was protected by a 13 mm armour, but the yoke of the main armament was protected by a casted plate 15 mm thick. The decision to launch the series production was made along with rearmament of the Germany, announced in autumn of 1935. The first machines, labelled as Ausf.a1 left the MAN production plant in May, next year. In the end, there were three series, 25 vehicles each: Ausf.a1, Ausf.a2 and Ausf.a3 – and their hull number plates covered numbers from 20001 to 20075. Every batch of the Pz.Kpfw. II Ausf.a had unique characteristics, that simultaniously made a mark of the search for optimal technical solutions for the new Panzerwaffe vehicle. The distinctive feature of the first 10 Ausf.a1 machines was the cast idler wheel with a rubber tire, which was in the end replaced with welded one, without the tire. In the Ausf. a2 variant, the fire barrier was added, which insulated the powerplant section from the fighting compartment and a wider inspection lid, granting access to the fuel system. Crews performing maintenance of these tanks noticed the need to improve ventilation and that problem was addresses quickly as well. Moreover, the radiator system of the power generator, delivered traditionally by the Bosch company, was also improved. The last series – Ausf. a3 had bigger radiator and reinforced shock absorbers. Between February and March 1937 next 25 tanks left the Nuremberg assembly lines, this time marked as Pz.Kpfw. II Ausf.b (sometimes one can find also version Ausf.a4 but because of many reasons such numbering seems incorrect). Vehicles, which hull number plates covered numbers 21001 – 21025 were equipped with stronger, 140 HP Maybach HL62TR engine, 6324 ccm displacement – because its larger fuel consumption the range fell by respectively by 20 and 35 km. Moreover, the power transmission system and gearbox were also improved, the drive wheel of new type was installed, as well as smaller return rollers. Installing wider tracks created demand for suitable road wheels and return rollers, although the hull system, created by Henschl factory, remained unchanged. All the modifications resulted in gaining weight – the vehicle became 500 kg heavier. Moreover, the rear mudguards were desgined as a separate, liftable component, so that it was easier to remove, for example, mud; once more the fresh air inlet system was improved – both to the fighting compartment and the engine bay. The Pz.Kpfw. II Ausf.b tanks were the first of the light, tracked Wehrmacht fighting vehicles, that were subsequently modernized in many ways. First modernization, invented by engineers of Magirus factory located in Ulm, was introduced already at the beginning of 1940 – they mounted a two-piece folding bridge on a turretless hull [such construction later became known as the vehicle-launched bridge]. At least 4 such vehicles, marked as Brückenleger auf Panzerkampfwagen II were used in May and June, the same year, on the eastern front, in ranks of the 7th Panzer Division. The next variant consisted of demolition vehicle (called also: self-propelled mine or beetle tank) Ladungsleger II, of which at least one was delievered to the 58th engineering battalion of the 7th Panzer Division. Other vehicles were allegedly used as mineploughs and maintenance vehicles, transporting spare parts and tools. Just like in the case of Pz.Kpfw. II Ausf. A, Ausf. B and Ausf. C, in the summer 1941 the engineers tried to rearm Ausf. b version from standard 20 mm KwK 30 gun with trophy French cannon Sa 38, cal. 37 mm. This version never came to life and remained a theoretical project only. The intensive trials on testing grounds, carried out in Germany right before the outbreak of the II World War, made clear that the Henschl hull and suspension was quite prone to breakdowns. That being so, in March 1937 the MAN factory presented first of the batch consisting of 25 vehicles of the next version – Pz.Kpfw II Ausf.c. Its distinctive feature was the suspension system consisting of 5 singular independently sprung larger steel wheels with rubber tires and 4 return rollers on each side of the tank. The return rollers were widened, what forced the creation of new version of the idler and tank’s fenders. This model was probably treated as temporary solution – as a proof of this theory researchers often point out the fact, that both the fuselage and the turret were made of molybdenum steel, which was of worser quality, compared to the standards.